UPDATE: I've added in a numbering scheme as requested in the comments! So, I have been working on a new rulebook for Hannibal and Hamilcar. The scope of the project is to make two entirely separate rulebooks (one for Hannibal and one for Hamilcar) and to format them into a less rigid style. The term "euro-esque" was thrown out: meaning that we're trying to break from the numerical rules wargame format and present them in a more flowing manner. -First of all, did I get any rules wrong? It is a really big game! -Second, what do you think of the format? -Third, What else do you think? Let me know! Below is the link. You can leave any thoughts here in the thread, by PM or by using the comment function. 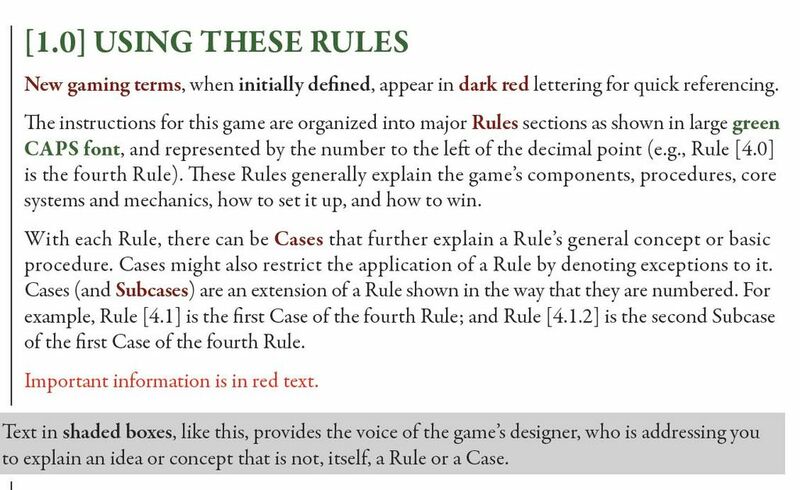 A fantastic idea given how poorly the new edition's rules are written. The most important addition of all is that of a glossary. It's a huge usability problem in the current one. Lastly, the numerically organized rules for wargames (like GMT stuff) is actually super helpful. It may look like a rigid legal document, but it is far clearer and easily to reference really quickly. Long blocks of text will decrease usability, not increase! This is not a Euro game. Wargames need easily referenced rules sections because of the large variability of play and choice. Players sometimes just need to know where to look for siege and retreat, for example, but not every time they play. The numbering system help make them easy to find and easy to reference. By all means rewrite them, but don't throw the baby out with the bath water. This is a Wargame. I note in this version on page 15 it says "as stated above...". That's useful, but not as useful as "as stated in 1.3a ..."
You need to know where it's stated above so you can skip to it quickly. Hmm, there seems to be a lot of love for numbers. I think that numbers can be easily added in again, and then linked to a table of contents. What do you think about the new flow and order of sections? I tried to group relevant information together as best as possible. Life is game, you gotta enjoy the journey. Life may knock you down sometimes. Its up to you if you stand up and live your life to the fullest. When i get time to look at it properly i Will provide feedback. One thing i would love to see is a new player aid. Turn summary and action and all relevant info in a player aid manner (no text wall). Battle summary including all bonuses, actions, number of battlecards etc. Yes, DO keep the numbering system! A numbered structure system maintains exactly that - structure. As many players across all gaming categories never really think about, a rulebook is actually a technical document. And every technical document requires structure in order to be effective. Also, as wargames usually have the greatest complexity out of any board game genre, then its rulebooks technical documents MUST meet that complexity with an equal amount of structure! Otherwise players can get mired down in misinterpretations and inferring things that are or aren't there. I myself missed a fundamental rule simply because it didn't adhere to the structure of the rest of the rulebook (Re: Two Movement Questions: After Interception, and Declaring In/Out of City). So yes, please keep the numbered structure system intact (and be sure that each rule belongs to a number)! Personally, I always have a harder time following a rulebook that doesn't use a hierarchical (i.e., numbered) structure. In the meantime, I'll be sure to review the draft document. Totally agree with this. I really prefer numbered cases and short declarative rules. I really dislike flowing rules where there are several concepts (however small) buried in a paragraph. (Band of Brothers is an example of the flow style.) The problem with flowing rules is that while it's an easier first read, it's really hard to find things later. It always feels like the thing you're looking for is buried in a paragraph somewhere. Whereas short, numbered, declarative rules are really easy to scan visually when you're looking for something. 1. The isolation rules should make it clear that you can trace a path *into* a space with an enemy PC, enemy tribe, or hostile tribe, provided that space contains friendly CU's. You just can't trace a path *through* such a space. 2. The isolation rules need to say that Rome removes isolated PC's first, then Carthage, since the removal of Roman isolated PC's can cause a Carthage PC not to be isolated. 3. The rule that roman reinforcements must be placed in a way that creates at least one space with 5CU is missing. Also, add me to the chorus of people who find it easier of the rules are numbered. The rules correctly have lots of cross references. Why have the cross reference say that it refers to one of the rules on page 7, and make the reader read all of page 7 to find what it's referencing, when you can point to exactly the rule you are referencing if you number things? I like clear numbered rules. But yes, the current rulebooks are an impenetrable mess for this newcomer, and I'd be grateful for a rewritten rulebook. -- Having just got the game, I tried working through the Playbook and doing the Tutorials, but they are missing so much information that I'm not sure what purpose they are supposed to serve--no one who doesn't already know the game well would be able to play the tutorial games, as far as I can tell. Being a newcomer and just read the rules, I tell you it isn't easy. Whilst I appreciate the reference numbers and ease of rule checking, we have that rulebook already, why not have a flowy modern rulebook with turn by turn examples etc to sit alongside? Give a newcomer half a chance to start with then let them mature to the 'technical document'? I don't think that a numbering scheme and a new format are mutually exclusive. I have put in a numbering scheme into the current and editing the original post. Would you kindly all take a look and check the flow and look for any inaccuracies? You may notice an amount of information removed from the original rules. The scenario book is going to get a large overhaul. Any information redundant with the rules will be removed, while rules for Scipio and Victory conditions (and a few other things) are moving there exclusively. Plus a few other changes. Thanks so much for the feedback so far! I really appreciate it. KS rulebook is the same you've got in your retail box. We are working on a rewrite, for some of the customers find the books in the box not good enough. FWIW, (and admittedly not much here), I really like the format that Victory Point Games uses for a lot of their rulebooks.